Will Russia use increased technology for its benefit, or will the country be overrun by protesting cyborgs? Young sociologists share their predictions. What awaits Russia 20 years from now? Politicians, economists and political scientists are all trying to find the answer to this question, and the Russian Academy of Sciences has asked young sociologists (under the age of 33) to offer their visions for the future. In an impressive turnout, 256 respondents from 43 Russian cities sent in applications for the Russia 2030 Through Young Scientists’ Eyes conference. Their presentations are proof that today’s graduate and post-graduate students share a rather sober assessment of the problems facing the country, and are even ready to offer solutions. Here is a sample of their ideas. Closed groups consisting of economic and political lobbies determine Russia’s current development. No real dialogue on this subject to speak of exists between the elite and society at large. Various social movements have next to no impact on the country’s social and political life, which means that social protest will grow in scale. These are the talking points from a presentation entitled Social Protest in Modern Russia: Some Aspects of the Problem and Forecasts, prepared by Igor Barinov, a post-graduate student in Moscow State University’s Department of History. According to his calculations, however, no revolutions are in store over the next few years, at least in part because Russia lacks a consolidated protest movement. There is nothing but disparate groups that stake claims to fame through either violent (like the events at Manezh Square) and non-violent (the Voina art group) means. Although these groups share some complaints, they are unlikely to unite because of the wide cultural and economic schism between them. Barinov says the state must make the first step by creating the means for expressing personal opinion--through mass media, for example. This would serve the state’s interests because Russian civil society is developing and, therefore, protests by the disillusioned are set to escalate. Besides social unrest, Russia is threatened by unrestrained worldwide development of information technology, nanotechnology, biotechnology, and cognitive science (NBIC). Maria Fokina, a fifth-year student at Tsiolkovsky State Technology University, forecasts that explosive growth in technology development is predicted to take place by 2025 and Russia could be threatened by scientific ambitions, the use of technology by terrorists, or epidemics. Fokina’s presentation, entitled National Security in Light of NBIC Technology, contains 61 possible threats. 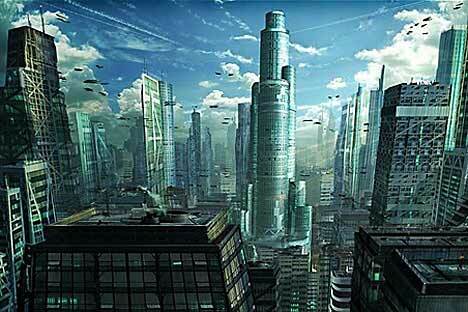 The consequences of technological development could be positive too – such as the colonization of other planets. But Fokina believes the negatives will outweigh the positives, including enslavement of people by robots and their processing for raw materials for cyborgs. Even if this sci-fi scenario fails to materialize, there are still other dangers, such as genetically modified foods, whose impact will become clear in a decade. The solution: develop domestic technology under state control. So far, Russia hasn’t been particularly successful in this area because of a lack of interest in the development of science, and the brain drain. That said, other forecasts show that the government is likely to invest more into the development of nano and biotechnology over the next 10 years. According to Alexander Babanov, a post-graduate student at the Institute of Economics and Anti-Crisis Management, in addition to technology, the state will invest in education, healthcare and nuclear power. The year 2010 was defining in this regard: Decisions made last year, such as the increased investment in and development of Skolkovo, will determine the country’s course for the immediate future. Babanov also sees an economic upside in the implementation of advanced technology in the housing and utilities sector--including cheaper and more durable pipes made of nano-based materials--and a decision to create second-generation space satellites. Some day in the future we will know if these forecasts would come true. In the meantime, an interesting piece of trivia: The conference participants were mostly the “Children of Perestroika," born between 1985 and 1987. This means they will be slightly over 40 in 2030, and will hold the fate of the country in their hands. They’d better start preparing today.